This art project doesn’t involve a camera, Instagram or anything like that. 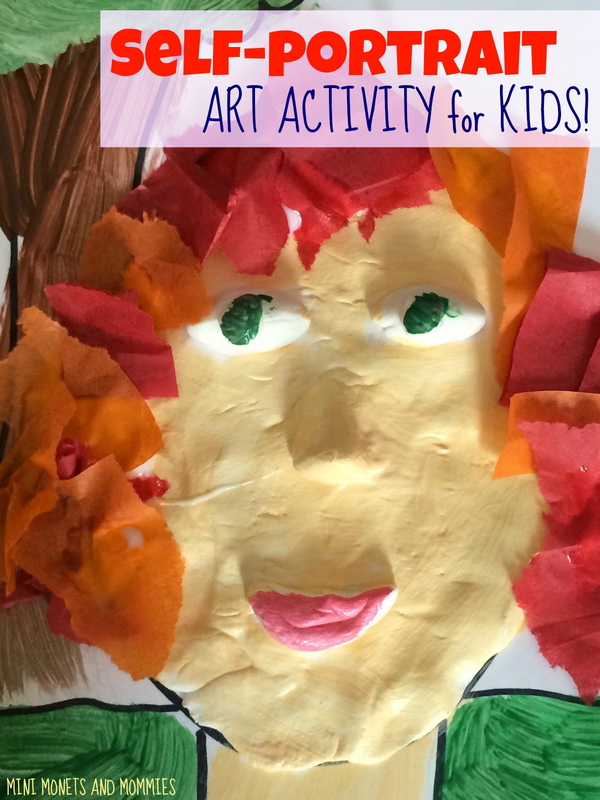 Your young artist can use her imagination to create a textured, mixed-media self-portrait. Aside from doing this project with my own child, I’ve done it maybe a million times (ok, possibly that number is actually lower) with kids in preschool through high school while working as a museum-based arts educator. 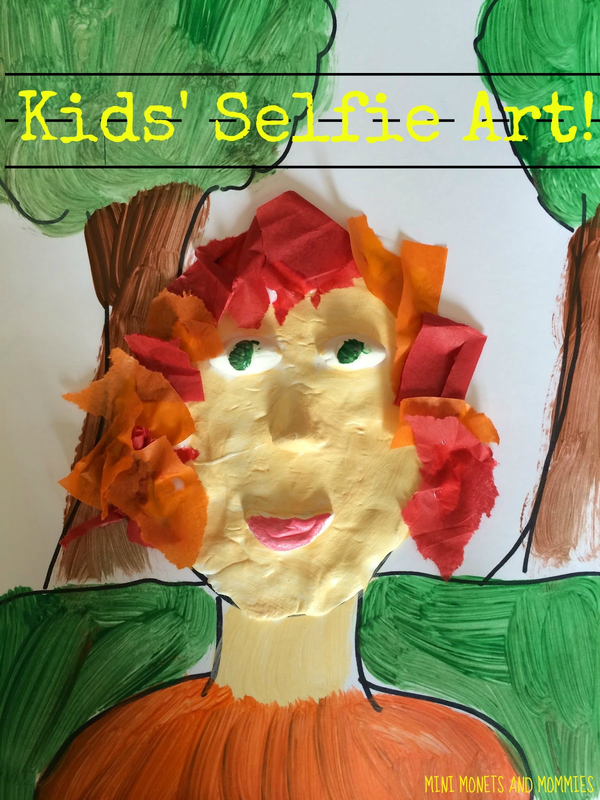 You can focus on something simple such as creating facial features (naming two eyes, one nose, one mouth, two ears) or make the art more in-depth and have your child come up with her own story behind the self-portrait. For example, she can create a magical woodland setting for the background and tell you all about it. · Cardboard- Cut apart an old box or just cut the front off of that used cereal box that’s hanging out in your kitchen. · Model Magic – Plain old white (your child will paint it). 1. Have your child draw her “face” onto the center of the cardboard. The bigger the piece of board, the bigger her face needs to be. Draw an oval, but leave it blank. Later on she will create facial features with Model Magic. 2. Draw a neck and shoulders (this selfie is just from the shoulders up). 3. Create a backdrop. Your child can stick with a plain background or she can draw a setting. 4. Cover the oval face with the Model Magic. Spread a thin layer across the oval. It will stick to the board. Your child can add pieces to create a nose, mouth, eyes and ears. She can also use her fingers (or a tool such as a craft stick) to mold some of the facial features. 5. Paint the face. Use temperas to add color to the skin, lips and eyes. 6. Color or paint the background, neck and shoulder areas. 7. Make hair. Cut or tear tissue paper and glue it to the top of the head. Use realistic colors or encourage your artist to get creative and collage on rainbow-hued hair or mix up a one-of-a-kind paint color. Great project, thanks for sharing. Pinning this! Nice mixed media art work. Visiting from Blog Hobnob link up. Have a super weekend. This is super cute and fun too! You are so creative :) I can't wait to do this with my little boy! This is fantastic! Super creative and it looks like a lot of fun! Very cute! I'm not sure my Bee is ready for this but Bunny probably is! This is a great idea for this summer! Thanks for sharing with CLIMB!